Clearly the powers that be do not want Magic: the Gathering to ever stop being all about creatures, since they keep giving Green, the creature color, more and more ways to push its point across through combat damage and deny opponents ways to stop them. The only card I can think of that can stop Thrun here is Contagion Engine, and even that requires 14 mana over at least two turns unaided. Blockers with infect could help bring Thrun down to size, and cards like Gatekeeper of Malakir are still around, but that's just about all your going to get for options. Your only hope when Thrun hits the other side of the table is to have a 5-toughness blocker, and even that hope may be short lived if Thrun's caster is also running enough Equipment to give Thrun some evasion, deathtouch, or even just power enough to kill that blocker you were banking on. I've seen plenty of decks that could never, ever beat a Troll Ascetic. In fact, I've found myself playing some of them down the years. And yet, that infamous card looks downright merciful compared to Thrun. It may be a long time until there's another creature that has as many different "unsolvability" characteristics as he does, so make the most of it - beat up on the counterspell decks, shrug at Day of Judgment, and tell Doom Blade where to go. You know you've always wanted to. Today's card of the day is Thrun, the Last Troll from the upcoming Mirrodin Besieged set. For four mana you get a 4/4 that can't be countered and can't be the target of spells or abilities your opponents control which makes this quite difficult for most decks to deal with especially if supported with any additional effects. The added ability of regeneration helps for handling most of those situations which makes this an easy choice to add a copy or two of in Green acceleration builds. If this had some kind of evasion or Trample it would be over the top, but even without that it is an efficient creature for the price. For Limited this should be a very good card as a first pick even if countermagic is not a major threat. Not being targeted by opponents, regeneration, and costing four mana as a 4/4 are all excellent attributes in the format. Legendary is unlikely to be a factor which leaves the bigger drawback as the reliance on Green in the casting cost and for regeneration. Normally a creature with regeneration should not be played until both the casting and activation cost can be paid, but with the targeting clause this probably can be played earlier in relative safety. In Sealed or Booster the deck should be primarily Green to facilitate a fourth or fifth turn Thrun at the latest and equipments or instants given a slightly higher draft priority with this as a stable target. The time has come for the next expansion. And that can only mean one thing, PREVIEWS! Today’s Card of the Day is a preview for the Mirrodin Besieged set. 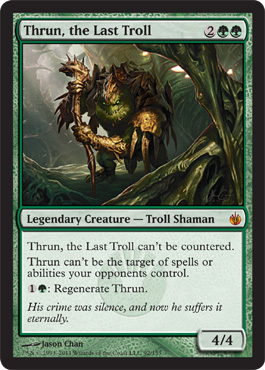 Today’s card is Thrun, The Last Troll. Two green mana and two generic mana gets this troll on the board. He is a 4/4 that can’t be countered. Oh, and he cannot be targeted by spells or abilities your opponents control. And lastly, for one generic and one green you can regenerate Thrun. All in all, a decent card for the costs, but not anything I am truly ready to salivate over. Once more of the set comes into light, perhaps there will be more potential. But still, getting what you pay for is just as good just the same. And anything that can’t be countered or targeted these days, and that can regenerate in case something does mass wipes, is good for me. I think honestly this guy is going to cause a lot of people to go ahead and start building fast paced green decks for professional play. This guy in with cards such as Emrakul, Terra Stomper, and Gaea’s Herald could start seeing a lot more action, especially with Autumn’s Veil able to help protect the other spells. But really, the extra protection is just to stave off the champion right now, black/blue control. However, the regenerate is useful in most other areas, too. Almost every deck has some way of removal, and none of them are guaranteed to work against Thrun. Again, as I have said before, Magic is becoming about getting what you pay for. And this guy delivers.